Regardless of our faith or culture, for many of us, the end of year is traditionally synonymous with getting together with our loved ones. Whether it is Thanks Giving, Christmas or New Year, it’s all about family reunions, sharing, giving & receiving, gratitude, love and peace. Grown-up children who are away at University or College come back home often for the first time in a few months. Similarly, parents come and visit or you might be going back to your country to spend time with them. It is with anticipation and usually high expectation that everybody is looking forward to their time together. So how can such opportunities to be ‘perfect times together’ turn so quickly into a nightmare? Many of my clients have shared their concerns and worries about being reunited with their families. Most of the time, they are right in expecting things not to be the same as when they were last together. Grown-up children who barely left 3 months ago have already adjusted to a more independent life at university or college. Their world has expanded, their wings have grown and we can’t expect the same from them. I remember how difficult it was to readjust to my gone-to-university children’s presence in the house when they first came back on holiday. It is such a precious time, we want to make the most of it, yet it is so difficult not to fall back into children/parents patterns of interaction and expectation. As for our own parents, living literally thousands of miles away from them, our experience of day to day life is often very different. Again, expectations are high and we can get very disappointed. So what is going on? After all it’s a time for celebration! Our yearnings for happiness, love, acceptance, closeness, intimacy and connection are very real. They are essentials to our survival as human beings. The problem is not so much with having those needs, as they are universal, but rather how to have them met. If as children these needs were met by our parents then we have built sufficient self-esteem to know that we are loved and accepted. Which means that as adults we are more comfortable at building intimate and emotional connections and we rely less on others to meet those needs. If however these universal needs were not met in our childhood, when we are adult, they turn into feelings of not being accepted, not being important to our partner (or to others) and into feelings of hurt, sadness, loneliness and often anger. For example, we usually expect to be happy and we often expect the world to fulfill our need for happiness. So when we re-connect with family members it seems rather normal that they should be the ones making us happy. What doesn’t help is the fact that we are not very good at asking for what we need… not in a way which is heard anyway… Often it comes out as blaming and anger and it is met also with justification, defensiveness, blame and anger. This is sadly a common pattern of communication, whether it is between partners or family members. When we realise that most of our expectations that need attention are based in the past, we can work out a way to fulfill this need now as an adult, without expecting others to do it for us. Basically, we need to let go of our expectations and for that we need to know what our yearnings are and what our expectations, or unmet needs are. How did I get disappointed? What do I want the other person to do or say? 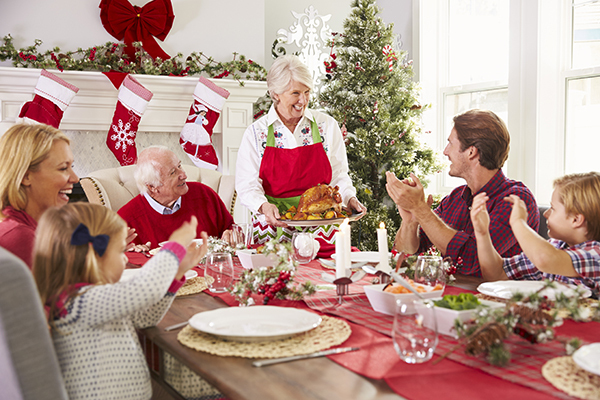 Here are 3 tips to help you create loving and peaceful time together with your family during the Festivity Season. Sit quietly for a moment, take a deep breath and exhale. Now, bring to your awareness the person(s) with whom you are having difficulty. Notice your emotions. What do you feel? What colour is this emotion? What shape is it? What is it made of? If it could talk, what would it say? You might feel some anger, frustration or fear. That’s fine: those are valid emotions too. Ask yourself: What am I yearning for? What do I need that I still don’t get? What do I really want? Is it love, acceptance, freedom, connection, support, recognition? What needs to change to get what I really want? Now, that you have identified your unmet needs, bring your awareness back to the person(s) you are having difficulty with. Ask yourself: What do I want from them? What am I doing for them that I’d want them to do for me? Now that you have identified your expectations, ask yourself: How would that benefit me? What is the cost of wanting this? Am I ready to let go of these expectations? Am I willing to accept and love myself? Am I lovable? What do I appreciate about myself? How can you make a commitment to yourself that you are important? Talking to a counsellor, having a spiritual practice or doing mindfulness meditation are ways to help you strengthen your sense of Self. If you want to know more about ways you can let go of your expectations, contact me for a free 20 minute phone chat. For this article, I want to thank all of you who bring issues for me to remind me that this is a life long journey of discovery and self-healing. Am I worthy of love and care? These are questions people ask themselves when committing to a close romantic relationship? Many elements will influence our confidence. 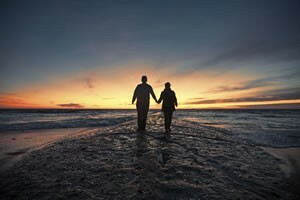 The confidence couples feel within themselves and within their relationship will not only depend on the quality of their own romantic relationship, but will also be influenced by the quality of their parents’ relationship and the care they received from their attachment figures when they were growing up. John Bowlby, a British Psychotherapist back in the 70s originally researched the adaptive behaviors such as crying and searching of infants when separated from their primary caregiver (someone who provides support, protection and care). Because infants can’t feed or protect themselves, their survival depends upon the care of their caregiver or attachment figure. It was then argued that the main survival strategy of our species is to stay close to our loved ones and that during our evolutionary history, our survival has depended on the ability of infants to maintain proximity to an attachment figure via attachment behaviors. Furthermore, Bowlby believed that, until infants are able to re-establish emotional and physical connection with their attachment figure, they experience profound despair and depression. Decades later, ample research into the nature of romantic relationship has been carried out. Much has been built on from Bowlby’s belief that human experience attachment ‘from the cradle to the grave’. And it is therefore now well accepted that the same despair is experienced by partners when they are unable to emotionally connect to their partner. 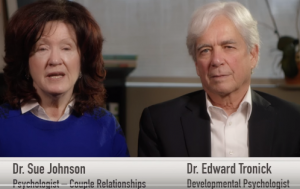 In this video, Dr. Edward Tronick, Development Psychologist and Dr. Sue Johnson discuss the powerful emotions the child experiences when his mum shows lack of emotional response and the same impact experienced by the partners during a disagreement. What do People Seek in a Romantic Relationship? Love, support, safety and connection! However, how do we express our most vulnerable emotions when we do not feel safe to do so? It can be daunting, especially when, as a child we weren’t encouraged or there was no one to confine to. Is there a gender difference in our way of behaving? Women have generally been permitted to show their vulnerability from an early age. Often they will be the first one to voice that something is wrong in their relationship. They will be more ready to pursue when their needs are not met. Whereas men, when young often learnt that emotions and vulnerability ‘are not for men’ and tend to withdraw from their emotions. They often go into ‘fixing’ mode, using intellectual skills to ‘sort out’ their partner and the situation. When couples have a strong emotional bond, they listen to each other with an open heart and mind. They are able to bounce back after disagreement and their relationship is not threatened. Often what brings couples to therapy is their endless arguments about everything. “You don’t understand me. You never talk. You are like a robot. You don’t even see me.” says the other partner. Couples say they can’t communicate when in fact they are caught in repeating patterns of interaction and become rigid in their position, they lose the initial emotional bond they had for each other. They feel desperately lonely, disappointed and disheartened. In her book ‘Hold me tight’ Dr. Sue Johnson comments that often one of the partners will be feeling rejected, unhappy, abandoned, betrayed, disconnected and lonely and will often say: “My heart is breaking; He/she is never there; Even when he/she is there he/she is never there”. Couples find it hard to believe that over time, they have lost the special attraction they had for each other. They want to regain what they felt at the beginning of their relationship. Understandably they want to understand what went wrong and want to find ways of repairing their life together. Partners will do anything to get a response from their loved one. Sue Johnson talks about the 5 steps partners take to reconnect³. 5. And, finally, in a good relationship, we find a way to turn back and reconnect. How can Emotionally Focused Therapy (EFT) help? Emotionally Focused Therapy for Couples (EFT) – Not to be confused with Emotional Freedom Technique or Tapping, the psychological acupressure technique – transforms relationships, and restore the emotional bonding partners yearn for. Emotionally Focused Therapy, developed by Dr. Sue Johnson, has helped thousands of couples to create and strengthen the emotional bond between them by helping them to be open, attuned and responsive to each other. Regardless of their cultures, religions, backgrounds and beliefs, couples all over the world have been helped by therapists working with Emotionally Focused Therapy. Research and studies show that 70% of the couples are able to repair and strengthen their relationship and 90% are able to sustain the repair. EFT helps the logical, more analytic individuals make sense of their emotions, their reactions and how they bond in their romantic relationship. With EFT, couples learn to navigate their intrapersonal emotions. They also learn to navigate their interpersonal dialogue. With EFT, couples get to understand how they function. It is not about the content of their arguments; it is not about who is right or wrong; it is not who needs fixing and who doesn’t. It’s about understanding the way partners interact. It’s about becoming aware of the ways partners move and how their behavior affect each other. EFT fosters personal growth through secure relationships. After a few sessions, partners come to understand the impact of their respective actions and start stepping off their dysfunctional way of being with each other. They start to be open, attuned and responsive to each other. They start creating and strengthening the emotional bond they have lost. It made sense in my head and it made sense in my heart. It totally fitted in with the way I was already working with my clients. I immediately saw how my clients would benefit from working at strengthening the emotional bond they once had or creating a new bond. Now, when I work with Couples, I know I have a secure humanistic frame which allows me to build a stable, warm, safe and supportive base from which they can explore past and present events of their life. If you feel your relationship would benefit from speaking to a therapist, you can contact me, give me call me on +971 55 732 99 66 or send me an email to evelyne@evelynelthomas.com and we can discuss your situation. How do you reconnect with your partner? How do you express your emotions? What do you do when you are stuck? Do you tend to pursue or withdraws? How do you get your partner to react? We can always learn from others. Feel free to share your experience or share the blog if you liked it.